Graveside funeral services for Thelma Neyland, age 75, of the Old Bowling Community, will be held at 10 A.M., Thursday, August 9, 2018 at the Old Bowling Cemetery. Mike Haney will officiate the service. Arrangements are under the direction of Walters Funeral Home in Centerville. Thelma Lee Neyland was born October 21, 1942 in Anderson County, Texas to Arles & Birtie Julia (Hastings) Herren. 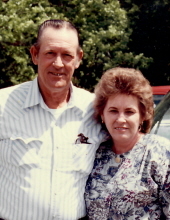 Thelma dedicated her life to her husband, children, and later her grandchildren, as a devoted wife and homemaker. There was nothing that she wouldn’t have done for her family. They were the most important part of Thelma’s life. One of her greatest joys was watching her grandchildren participate in their various sporting events. Thelma was sure to be in attendance as much as she was able. Although she was an exceptionally faithful matron of the home, Thelma still found time to assist in the public workplace. Upon her late husband’s passing, Thelma fulfilled his term as Leon County Commissioner of Precinct 4. She later served as manager of Wallace Tire and Battery in Centerville for ten years. Thelma enjoyed ceramics, painting and sewing. She was a fifty-seven year member of Clear Creek Missionary Baptist Church where she was a bookkeeper and piano player until her health began to fail, as well as, a lifelong resident of Leon County. Thelma passed away the evening of August 7, 2018 at her home. She was preceded in death by both of her parents; husband, Curtis Neyland, Sr.; one brother and five sisters. Surviving family members include son, Curtis Neyland, Jr. (Janis) of the Old Bowling Community; daughters, Carla McEachern (Rob) of Centerville and Christie Stanford of the Robbins Community and brother, Wylie E. “Gene” Herren (Helen) of the Old Bowling Community. Thelma is also survived by grandchildren, Staci Ann Schakel (Jonathan), Courtni Symons (Keith), Lesli Neyland, Robert Curtis “Bobby” McEachern (Madison), Carlee McEachern (fiancé, Jared Winstead), Chelby Fuller (Lawson), Dean “Cole” Stanford & William “Curtis” Stanford and great grandchildren, Jaxon Schakel, Savana Schakel & Ryett Fuller. In lieu of flowers, memorial donations may be made to the Old Bowling Cemetery Association c/o Cindy Payne, 13387 CR 344, Marquez, Texas 77865. To send flowers or a remembrance gift to the family of Thelma Lee Neyland, please visit our Tribute Store. "Email Address" would like to share the life celebration of Thelma Lee Neyland. Click on the "link" to go to share a favorite memory or leave a condolence message for the family.